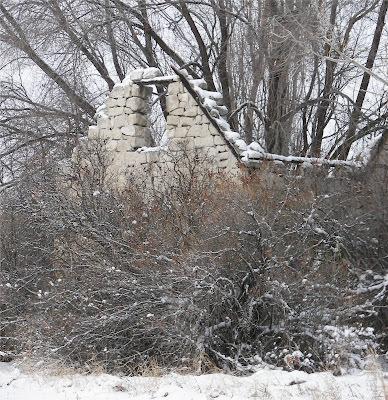 A forum for sharing information about the rock houses built by the Utah pioneers. This blog is an attempt to start a conversation about restoring, maintaining, and living in old pioneer rock houses. It comes from a little town in Northern Utah that has about two dozen pioneer rock houses that were built between 1875 and 1900. There are old rock houses elsewhere in Utah and the West and would like to include all pioneer rock-house dwellers in this forum. To get things rolling on the forum, I'll include some pictures of my rock and log cabin in a separate post that I'll call Our Rock Houses. If you want me to add yours to that posting, email me some pictures and some information about it. Here is a picture of a falling down rock house down the road from me. Someone told me it had a fire. But the rock is still standing! Local history says that there are so many rock houses in this little Utah town (pop. 700) because one of the early settlers built a house out of wood, which burned down just after it was finished. He decided to try again, but used rock the second time around. I guess it caught on. They imported the rock from a quarry just west of here. I think the rock came from a place called Rigby's Ranch. - The 3 Little Pigs revisited ... How Solid is a Rock House? Let me know what you think. To join the conversation, use the Comment feature. But there may be some crazies out there. So you might want to withhold your full name, address, and phone number from public view. If you want to add information regularly, contact me via email, and we'll see if we can add you to the list of people who can post to this blog. If you want to include information about your house on a one-time basis, send it to me and I'll post it. Thanks for putting this blog together. My husband and I are currently in the process of restoring a rock house. Any helpfull hints on what works well or warnings about what not to do will be much appreciated. I'll also attempt to convey some of the practical wisdom my husband's been forced to learn through our adventures. Susan, I just visited the blog again, and wanted to say I really enjoyed it. It's not got alot of posts yet, but if you keep it up, I bet it will. If you like we could share the blog on something connected to the Heritage Area.